The TOGAF documentation states very clearly that you need to customize and adapt the material to suit your particular needs. But TOGAF doesn’t explain how, exactly, you go about customizing the material. This article will explain how a set of really practical and useful architecture frameworks can be created, based on and reusing the material from TOGAF. It also provides an overview of the four simple steps you can follow to quickly build detailed checklists from TOGAF and other sources; to select the relevant factors you need for a particular project; and to combine them to form a set of multiple integrated architecture frameworks. Using our straightforward guidelines, you will be able to create practical frameworks to help you think about and manage your enterprise architecture. 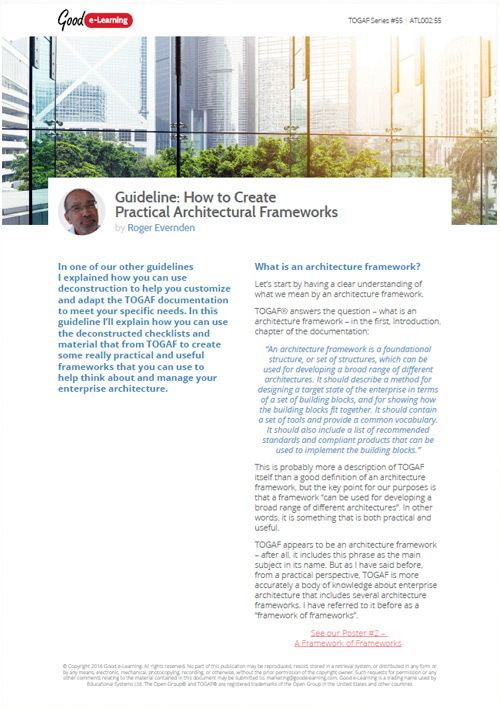 Download your copy of this TOGAF article to start creating your own practical architecture frameworks today!